The Samsung Galaxy Nexus has finally gone on sale in the UK - but only in one store in London. 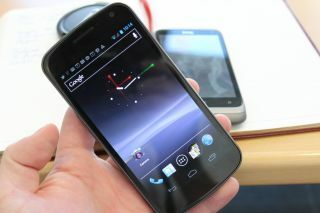 Phones4U is the first store to be stocking the much-hyped Galaxy Nexus, and opened its doors at 8am to give customers the chance to pick up the world's first Android 4.0 or Ice Cream Sandwich handset. The phone, which features a 4.65-inch screen and a pin sharp 1280 x 720 resolution, will cost from £41 per month for a free phone - we're hoping that price drops somewhat when other retailers start stocking it. Phones4U is also offering up a £250 voucher for the first 100 purchases for movies and music (and film, according to Phones4U... although we assume this is the same as movies really). It will only be available from the 112 Oxford Street store today, which means you'll need to hurry down if you want to see the latest from the Android world. There will also be Ice Cream Sandwiches (Choc Ices to you and me) on offer from 11am for those that want to 'cool down' - but seeing as we're nearly at winter in the UK, it will be interesting to see how those go down.